Net Neutrality Special Edition - Tuesday, October 23, 2018 | Techdirt. So we've made it pretty clear by now that the FCC's entire justification for repealing net neutrality was based entirely on fluff and lobbyist nonsense. But because the Administrative Procedure Act requires that regulators actually provide hard data to justify massive reversals in policy, both the Ajit Pai FCC and his BFFs at Verizon, Comcast, and AT&T have clung tightly to one, completely false claim: that net neutrality harmed network investment. But as we've stated countless times, that's simply not true. That's not an opinion, it's based on SEC filings, earnings reports, and the on-the-record statements of nearly a dozen telecom industry CEOs. "Broadband investment rebounded in 2017, as a series of positive consumer and innovation policies and a pro-growth regulatory approach helped reverse the industry’s previous spending pullback, according to new research released today by USTelecom." One obvious problem: net neutrality wasn't officially repealed until June of 2018, making any claim that the 2017 CAPEX spike was due to its repeal utterly laughable. And again, it's worth noting that even the 2015 dip US Telecom leans so heavily on has been hotly contested. 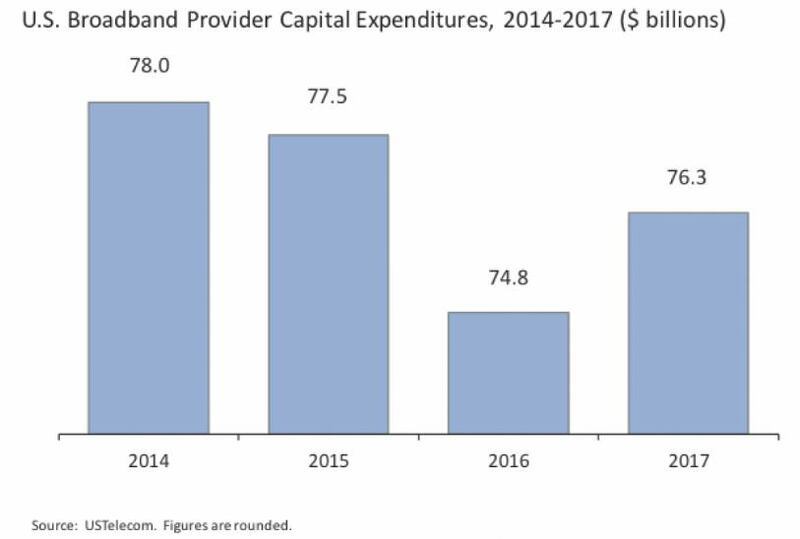 CAPEX dips in 2015 for AT&T, for example, came because the company ended a wave of U-Verse broadband upgrades, not because of net neutrality. Similar CAPEX dips at Charter occurred because the company ended the deployment of digital cable adapters. Other ISPs saw CAPEX spikes during that same period. CAPEX and network investment fluctuations can occur due to a myriad of things, from a company ending its planned roll out of a new set top box, to the routine deployment of standard security improvements. ISPs routinely hire economists who are willing to fiddle with the math and cherry pick very specific windows of CAPEX to suggest net neutrality is to blame. But massaged data funded by telecom lobbyists isn't science, it's theater. Meanwhile, defining the health of the industry based on CAPEX and investment alone is a fool's errand, and if you want to truly judge said health, you'd need to look at the level of competition, consumer prices, and all of the obvious, ugly metrics you can be damn sure a telecom lobbying firm primarily bankrolled by AT&T isn't going to want to talk much about. "Since my first day on the job, this agency has been focused on cutting through the regulatory red tape and increasing broadband investment, most importantly in rural America where the digital divide remains all too real. Today’s report confirms that the FCC’s policies to promote broadband deployment are working. After Internet service providers reduced new investments in 2015 and 2016 under the prior Administration’s regulatory approach, broadband investment increased in 2017 by $1.5 billion over the previous year. That’s real progress for American consumers, and another step toward better, faster, and cheaper broadband for all Americans." Can we again stop to appreciate the U.S. government parroting lobbyist talking points and filing lawsuits in perfect unison without absolutely ZERO concern for the ethics or optics? One yearns for the day when we used to at least pretend that lobbyists weren't directly dictating tech policy, leaving genuine consumer welfare a distant afterthought. Again, like so many other aspects of the Trump era, the hope is that if you repeat a lie frequently and often enough, it becomes truth in the minds of Americans (or at least in the minds of your partisan supporters). But as John Adams once declared, facts are stubborn things, and no matter how many press releases he issues, the facts aren't on Ajit Pai's side.